Teeth whitening is one of the most popular cosmetic dentistry treatments available. The speed with which the treatment can be administered, as well as the immediate results, make this an in-demand and incredibly effective smile transformation. When you want to see a significant change in the color of your teeth, professional in-office teeth whitening delivers an amazing makeover. In just about an hour, you can have a whiter, brighter, better-looking smile. A high-concentration peroxide gel is applied to the tooth enamel, effectively separating stain molecules and making teeth up to eight shades whiter. The powerful peroxide whitening gel achieves what over-the-counter whitening treatments will never be able to master – immediate, long-lasting teeth whitening results. There is no way to recreate the strength of the gel used in the in-office whitening treatment. However, a teeth-whitening kit purchased from your Chester Hill dentist for use in your own home will be far more effective than an over-the-counter method of whitening. The gel has a lower strength so that it can be applied for longer periods of time and is lower in user-error. The trays are usually worn for a few hours a day or overnight for a few days or weeks. The whitening timeline recommendations will vary for each individual patient. Why Get a Professional Teeth Whitening Treatment? Gums are sensitive. Whitening treatments can easily irritate them. Your dentist will protect your gums with a desensitizing gel or shield to ensure that you experience zero discomfort during this non-invasive cosmetic dentistry treatment. Any whitening treatment other than professional teeth whitening is temporary. Whiteners bought over-the-counter only tackle surface stains. Chester Hill teeth whitening can last for years thanks to a powerful peroxide whitening agent that breaks apart stains. Over-the-counter whiteners often result in uneven whitening, especially if you have any porcelain veneers or crowns. 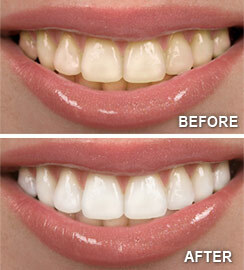 It is also easy to abuse whitening treatments. Some people do see results, like what they see, then whiten too much. This behavior can damage tooth enamel. If you compare the results of over-the-counter whiteners with a professional whitening treatment, the whitening from your dentist is far superior. Even if your teeth aren’t perfect in alignment, shape, or size, whiter teeth will make you look healthier, happier, smarter, and even wealthier. Some people will never see results from any whitening treatment. Your Chester Hill dentist will determine whether this is the case before any efforts are made to whiten your teeth. If you have extrinsic tooth stains on the surface of your teeth, this discoloration can be broken apart by professional teeth whitening. Yellowish stains within the teeth, known as intrinsic stains, can only be corrected with porcelain veneers or Lumineers. Unfortunately for some patients, they are simply born with teeth that aren’t super-white and will never be because of teeth whitening. In cases like this, cosmetic dentistry is the best option to eliminate dullness. Some teeth are discolored because of a lengthy smoking habit. Other patients are dependent on coffee or dark soda. Poor oral hygiene can play a role in tooth discoloration. Aging can work against you and start to make your teeth look darker, browner, or yellower. The normal wear-and-tear of biting and chewing and drinking works against teeth. Thin tooth enamel is more susceptible to developing stains. Ultimately, teeth whitening is a life-changing smile transformation. This procedure is easy, fast, and offers immediate results. Find out if you’re a good candidate for professional teeth-whitening. Contact our Chester Hill dental office to schedule an appointment with Dr. Chi Fu. We proudly serve the residents of Rye, Westchester, Rye Brook, Port Chester, and surrounding areas, including Greenwich, CT.